One of the most controversial of all midwestern birds is the Blue Jay. People either love it or hate it–there’s no in between feelings about a jay. People who hate Blue Jays are most vocal in the summer, the time when Blue Jays are caught snatching baby birds. If a Blue Jay discovers the nest of a robin or Chipping Sparrow, every one of those babies is probably doomed. That’s all the evidence most people need to condemn the Blue Jay as a vicious avian villain. The Blue Jay is indisputably among the most beautiful of all birds, but that doesn’t convince a Blue Jay hater of its worthiness–“a wolf in sheep’s clothing,” he’d say. And the Blue Jay is among the most intelligent of birds, too. “Well, then, it should know better than to pick on innocent little baby birds,” he’d respond. Nobody seems to feel sorry for a robin’s innocent baby worm victims, or the tiny bugs gobbled up by hummingbirds. And hardly anybody seems to care about the hungry baby Blue Jays that need animal protein for their own survival. One definition of the word “jay” in Webster’s Dictionary if a foolish or talkative person. If someone crosses a road illegally, he’s jaywalking. If he crosses a road without clothing, he’s naked as a jaybird–and if he jaywalks without clothing in Duluth in winter, he’s crazy as a jaybird. Blue Jays do have their ardent defenders, though. It’s easy to admire a bird which mates for life, as many Blue Jays do; a bird which alerts the whole neighborhood of an invading cat, snake, hawk, or owl; a bird which plants more acorns than it will eat, reforesting its property for future generations; a bird which will risk its own life to protect a fallen comrade. A group of jays have even been recorded feeding and guarding an old, partially blind jay and leading it to water. The Blue Jay, which is in the same family as the crow and raven, is omnivorous–it eats three times as much vegetable matter as animal, and most of its animal food is insect. At bird feeders it is fond of suet, sunflower seeds, and especially peanuts. It has a pouch in its throat for carrying food–it buries acorns and sunflower seeds in the ground and hides them in knotholes and the crevices of tree bark. 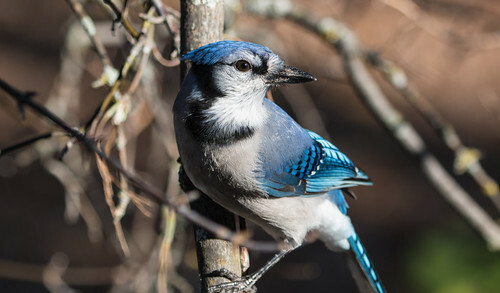 In spite of popular belief, Blue Jays do remember where they hide food, and depend on their caches for winter survival. In turn, they are a favorite food for Peregrine Falcons and bird hawks, called accipiters.